American Donald Young at 2012 Wimbledon Championships. NEWPORT, RI (AP) — Michael Russell beat fellow American and seventh-seeded Donald Young, 1-6, 6-1, 6-4, Monday in the opening round at the Hall of Fame Tennis Championships. The tournament, the only one held on grass courts in North America, features a number of Olympians from 10 countries scheduled to play before heading to the London Games on Wimbledon’s grass surface later this summer. Young, the 57th-ranked player in the world entering the week, is part of the US Olympic team. Young dominated the opening set, winning 10 of 11 first-serve points and 16 of 18 service points overall. 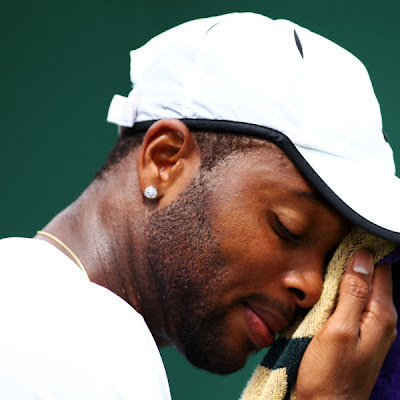 He closed the set in 25 minutes before the 96th-ranked Russell changed his attack. In the final set, Young fought off three match points in the ninth game before Russell closed it out when Young hit a backhand service return into the net on the final point.